The food crisis, «which is more grave than the financial crisis». The promotion of human life, because «those who insufficiently value human life perhaps do not realize that in this way they are proposing the pursuit of a false peace». And then, the affirmation of social rights, beginning with the right to work; the need for a new model of development; the push for a «pedagogy for peacemakers» – an issue that Benedict XVI has raised repeatedly since his message for the 20th anniversary of the Assisi’s meeting of Religions, in 2006. These are the challenges and the agenda of peacemakers, outlined in the message of the next World Day of Peace, which is about – after the Gospel – «Blessed are the peacemakers». The Papal message for the World Day of Peace is particularly important. It is delivered to foreign ministries of all over the world, and from it Benedict XVI draws for the traditional speech he delivers at the beginning of every year to the ambassadors accredited to the Holy See. This year’s message perfectly tracks the themes of the recent Synod for the New Evangelization. In the message, the Pope maintains that a renewal of the proclamation of Christ is the first and fundamental factor of peace; and affirms that a new commitment and a new ethic can come about, above all, from the encounter of people with God. And because of that encounter, the hierarchy of criteria that govern the world today can be turned upside down. Because of that encounter, there power and profit no longer prevail over everything else, and aims and means are corrected. Only in Christ can peacemakers face the challenges which awaits them. 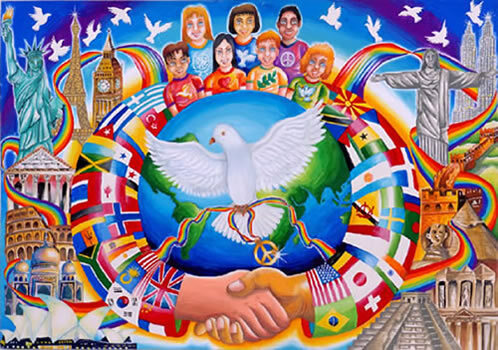 Themes of the Message for the World Day of Peace. The Pope’s appeal is supported by data. This data is not in the message, but is – one could say – the architecture on which the Papal appeal is based. This data shows that several basic foodstuff prices are dangerously close to 2008 levels, when turmoil over bread prices exploded in about 30 countries. Yet if prices oscillate so often that it is really difficult to plan for investments in agriculture – UNCTAD, a United Nations agency, advises – it is because of finance. In fact, the exchange of finance derivatives of basic foodstuff is 20-30 times bigger than investment in the real market. Investments in agricultural lands in developing countries – OXFAM data shows – increased by 200 per cent in 2008. Sixty percent of land purchases took place in countries where there is hunger. These hectares, which could feed a billion people, were used to cultivate and produce biofuels. It is a subsidiarity principle, which should be applied in facing the economic crisis. «The ideologies of radical liberalism and technocracy – the message states – reflect the conviction that economic growth should be pursued even to the detriment of the state’s social responsibilities and civil society’s networks of solidarity, social rights and duties.» Among social rights and duties «most under threat today» is the right to work. Several times during his pontificate the Pope spoke about the right to work, even expressing his solidarity toward those who did not have an employment to sustain themselves. Without work there is no opportunity to build the future, nor a family. But the Papal denunciation perhaps looks further, to China – where social rights seem to be a utopia – and to a Europe in an economic and identity crisis, where social rights are diminished with the excuse of the lack of resources. «The reason for this – the Pope writes – is that labour and the rightful recognition of workers’ juridical status are increasingly undervalued, since economic development is thought to depend principally on completely free markets.» The goal of access to steady employment for everyone must be achieved, as stated in Benedict XVI’s social encyclical Caritas in Veritate. In the mean time, there is a need of «a fresh outlook on work, based on ethical principles and spiritual values that reinforce the notion of work as a fundamental good for the individual, for the family and for society. Corresponding to this good are a duty and a right that demand courageous new policies of universal employment». The Pope aims even higher. He says that «neither is it just to introduce surreptitiously into legislation false rights or freedoms which, on the basis of a reductive and relativistic view of human beings and the clever use of ambiguous expressions aimed at promoting a supposed right to abortion and euthanasia, pose a threat to the fundamental right to life». The Pope is also referring to the UN resolution «Preventable maternal mortality and morbidity and human rights», adopted on September 21, 2012 by the UN Council for Human Rights, which would surreptitiously open the door to a «right to abortion». It is a whole UN vocabulary that should be changed, as noted by Silvano Maria Tomasi, the Holy See permanent observer at the UN Council for Human Rights in Geneva. This change of vocabulary – a vocabulary which roughly dates back to the sexual revolution – lead to the disappearance of the word «abortion» in international documents, substituted by the more neutral right to reproductive health; but it also lead to the disappearance of the word «family» from the United Nations vocabulary. The semantic borders are so ambiguous that there is a risk to mistake religious freedom with freedom of worship or expression. There is the need of a «pedagogy for peacemakers», comprised also of a rich interior life, clear and valid moral points of reference, and appropriate attitudes and lifestyles. In fact, «acts of peacemaking converge for the achievement of the common good; they create interest in peace and cultivate peace. Thoughts, words and gestures of peace create a mentality and a culture of peace, and a respectful, honest and cordial atmosphere». It is «a slow process», for «there is a need to renounce that false peace promised by the idols of this world along with the dangers which accompany it, that false peace which dulls consciences, which leads to self-absorption, to a withered existence lived in indifference». 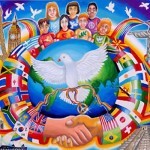 A pedagogy of peace, instead, «implies activity, compassion, solidarity, courage and perseverance». Ultimately, it is about the realization of the Beatitudes. And the Beatitudes – Benedict XVI reminds us in the very beginning of the message – are promises, not merely moral exhortations. written article. I’ll make sure to bookmark it and return to learn more of your helpful info. Thank you for the post. I will certainly return.